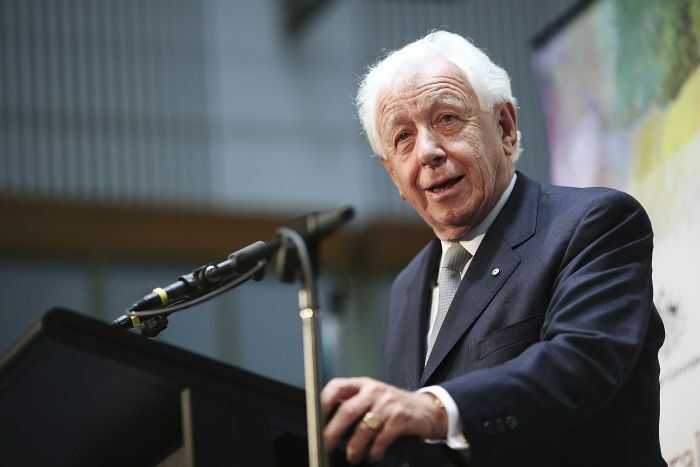 Billionaire Frank Lowy has offered a scathing assessment of Australia’s current political climate, describing the recent spate of leadership challenges as unacceptable and urging democracy to be “treated with care”. “Having five prime ministers in five years is not acceptable,” he said in the speech in front of political and business heavyweights on Thursday night. Mr Lowy, the co-founder of shopping centre giant Westfield, spoke at the event to mark the Lowy Institute’s 15th anniversary, describing nation-building as a “tough task” but saying remaining in the top job appeared to be even tougher. The 87-year-old criticised the nation’s tone towards immigrants, and praised the work of former foreign minister Julie Bishop, who introduced the businessman at the event. Ms Bishop described Mr Lowy as “one of the nation’s finest citizens” and said his story reflected the “quintessential truth of our good fortune as a country”. Mr Lowy arrived in Australia at age 21 with his brother after escaping persecution in Europe during World War II and fleeing as a self-described “boat person” to Palestine. He said that during his 70 years in Australia, he had experienced a nation that was open to new ideas, but felt that sentiment had declined. “I think we are moving in the wrong direction,” he said. Mr Lowy told the powerful gathering he was disturbed by the tone of the debate. “Now that our borders are secure, I believe we can afford to be ambitious on immigration and generous towards refugees who come through the established processes,” he said.